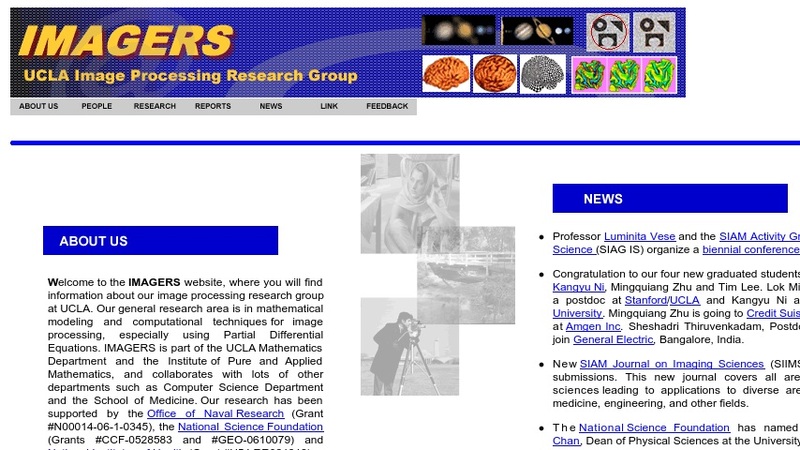 The University of California at Los Angeles' Image Processing Research Group (or IMAGERS) focuses on mathematical modeling and computational techniques for image processing, with a particular emphasis on using Partial Differential Equations. The group is part of the UCLA Mathematics Department and the Institute of Pure and Applied Mathematics, but also collaborates with other departments on campus. The research areas described on their website include: Image Reconstruction, Inpainting, Computation, Segmentation & Active Contours, Level Set, Wavelets and Compression, Tomography, and Vision Modeling. They provide overviews of each research area along with links to full reports offering more in depth explanations. Recent papers by IMAGERS' researchers are posted online and available to download free of charge.